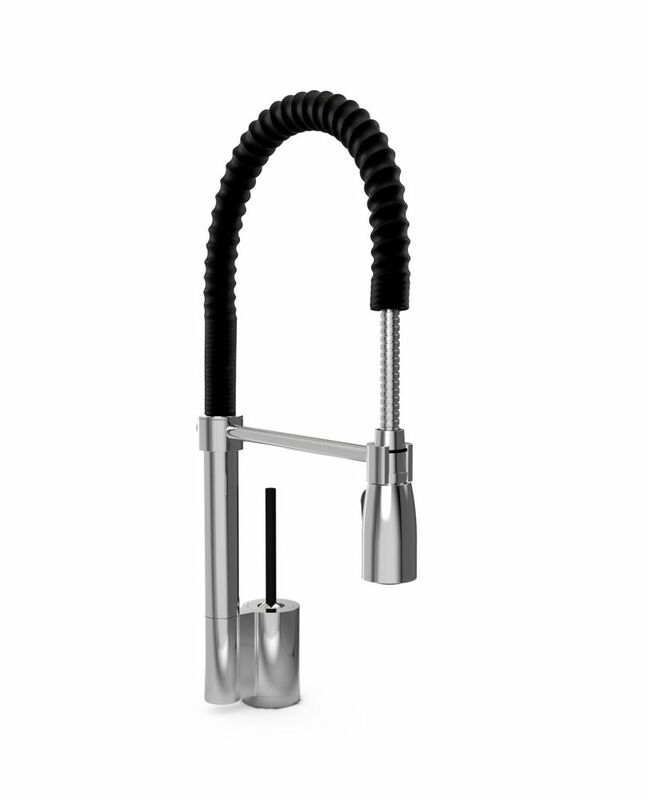 Kitchen faucet, modern style, in chrome and black finish. This single lever faucet has a solid brass body and a 2-function spray. The included plate allows installation on a 1 or 3-hole sink. 18" stainless steel flexible hoses. Full collection carries old world charm through an entire home. Soft curves offer a timeless design. 9 high spout swings 360 for added convenience. Matching soap dispenser for coordinated look. Single lever handle for ease of control. Matching bar/prep sink faucet for coordinated kitchen. Available in store by Special Order Only. See associate for details. A perfect fit for the modern kitchen, Kraus Commercial Faucets have open coil spouts with an industrial look. This versatile kitchen faucet features a multifunctional pull down sprayer with spray, stream, and pause options. The gooseneck spout rotates 3600, providing enough room for unobstructed sink use, even with your largest cookware. Durable lead-free brass construction and top quality components ensure that your Kraus faucet will function as beautifully as it looks. All mounting hardware is included for single-hole installation. Choose from chrome and stainless steel finish to match your kitchen appliances. Single Lever Kitchen Faucet with 2-Function Spray - Chrome/Black Kitchen faucet, modern style, in chrome and black finish. This single lever faucet has a solid brass body and a 2-function spray. The included plate allows installation on a 1 or 3-hole sink.